Content marketing continues to be an integral strategy for B2B companies; however, objectives for content strategies are shifting toward thought leadership and educating the market, according to a survey from Curata. Nearly 9 in 10 surveyed B2B marketing professionals (87%) say they use content marketing to achieve business goals, up from the 82% who said so in 2011, the survey found. 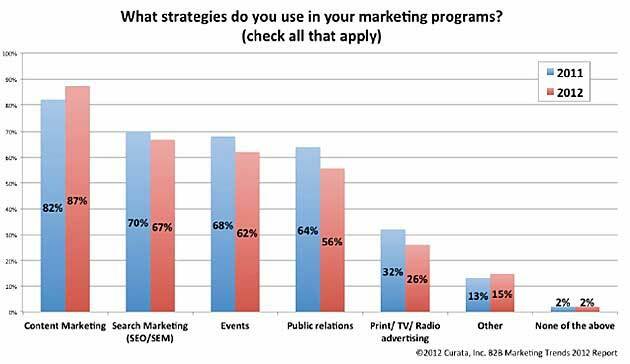 Other top channels in marketing strategies in 2012 are SEO (67%) and event marketing (60%), according to the study.